What is to be done in a crisis like the genocide in Rwanda, when the international community seeks to stop the killing? Can nations, acting through the UN Security Council, fulfill a "responsibility to protect" innocent civilians? Or is such a doctrine just a Trojan horse for great power abuse? When nations send their military forces into other nations' territory, it is rarely (if ever) for "humanitarian" purposes. They are typically pursuing their narrow national interest - grabbing territory, gaining geo-strategic advantage, or seizing control of precious natural resources. Leaders hope to win public support by describing such actions in terms of high moral purposes - bringing peace, justice, democracy and civilization to the affected area. In the era of colonialism, European governments all cynically insisted that they acted to promote such higher commitments - the "white man's burden," "la mission civilisatrice," and so on and so forth. The appeal to higher moral purposes continues to infect the political discourse of the great powers. Today's "humanitarian intervention" is only the latest in this long tradition of political obfuscation. In 2003, the US-UK invasion and occupation of Iraq was labeled "humanitarian intervention" by UK Prime Minister Tony Blair. Still, should intervention (even multilateral intervention, approved by the Security Council) be excluded in all circumstances? This section looks at the issues and the fierce debate that has arisen within the United Nations about these "new approaches" to sovereignty and collective action. "In whose name? A critical view on the Responsibility to Protect” by Lou Pingeot and Wolfgang Obenland provides an overview of the history and content of R2P, its positive contributions and its flaws. It concludes that R2P does not give a satisfying answer to the key question it is supposed to address: how best to prevent and, if prevention fails, respond to large-scale human rights violations and killings? The concept is particularly dangerous as it amalgamates arguments and proposals, mixing uncontroversial and widely accepted notions (that states have a responsibility towards their citizens) with more dubious claims (that military intervention is an appropriate tool to protect civilians). Rather than building a last resort option – military intervention – for when all else fails, there is a dire need to devote attention and energy to prevention and to ensuring that the international system does not fail to begin with. Existing legal instruments and institutions for crisis prevention and management fulfill many of the functions of R2P without undermining the principles of peaceful dispute settlement or the equal sovereignty of states. The report ends with an overview of alternatives that deserve more reflection and action. In whose name? is available for download. Secretary General Ban Ki-moon's 2012 report focuses on R2P's "third pillar" and the potential use of force authorized under the doctrine. The "Responsibility While Protecting" is a Brazilian initative meant to respond to the BRIC's concern about potential abuses of R2P for military interventions. 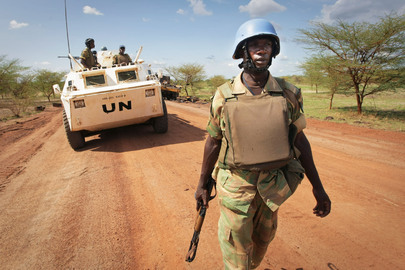 It sets a set of principles to supervise Security Council's mandates under R2P as well as better monitoring mechanisms. Secretary General Ban Ki-moon's 2011 report focuses on the necessity for R2P to incorporate a regional dimension in order to be better accepted internationally. Secretary General Ban Ki-moon's 2010 report focuses on the prevention mechanisms of genocide and crimes against humanity as part of R2P. The final report of the International Commission on Intervention and State Sovereignty (ICISS) introduced the concept of common "responsibility to protect" in cases of genocides, crimes against humanity, war crimes and ethnic cleansing. This ICISS report charts the evolution of "sovereignty as responsibility" and attempts to develop consistent, credible and enforceable standards to guide state and intergovernmental practice on humanitarian intervention. The European network of Peace Churches has issued an important statement critical of R2P. The statement opposes the "protection" of threatened peoples through use of military force. As an alternative to R2P, the statement supports strengthened OSCE missions and nonviolent intervention. In 2005, the UN developed the "Responsibility to Protect" (R2P) doctrine, ending the era of "the inviolability of borders." According to this Council on Foreign Relations article, since the doctrine emphasizes the responsibility to "react," "prevent" and "rebuild," its full implementation suggests regime change. Further, major powers determine when and how to implement R2P, according to their geo-strategic goals, national interests and the relevance of the targeted country to the "world community." This confirms the poorer countries' fear of international intervention as a threat to sovereignty. This Development & Cooperation debate showcases an ardent proponent and a fierce critic of the "Responsibility to Protect" (R2P) doctrine. Ramesh Thakur argues that R2P offers a sound basis for deriving the rules of multilateral action in a world that, he believes, can never free itself of military intervention. Such thinking contributes to a "new militarism" because violence can never achieve humanitarian goals, urges Mary Ellen O'Connell. Rather than legitimize "doing good" by violent means, O' Connell suggests that the UN adopt a responsibility to do no harm. This Foreign Voices debate suggests that the R2P doctrine can only protect human rights in the context of non-violence. By citing the tragedies of Srebrenica and Rwanda, R2P enthusiasts divert attention away from the meddling role of Western countries in creating crises. One essay notes that the central element of the Responsibility to Protect is to prevent conflict rather than react through military means. Regional arrangements like the African Peer Review Mechanism, not foreign armies, ensure efficient prevention. In 2005, the UN General Assembly adopted the concept "Responsibility to Protect" (R2P). Since then, several institutions are launching research centers promoting the R2P concept and Secretary General Ban Ki-moon has created an assistant secretary general post on R2P. This New York Times article supports R2P but acknowledges that advocates have begun to discover that theory is not easily converted into practice. Moreover, some developing countries worry "that they could become targets of intervention." This Humanitarian Policy Group brief analyzes the nexus between humanitarian, political and military action within Darfur. Questioning the impartiality of aid agencies in formulating policy positions, the report claims that traditional notions of neutrality are being eroded. This "non-permissive advocacy", has led to "high levels of insecurity for aid workers, and continuous efforts by the Sudanese government to curtail what it believes to be â€˜political' activities." This Monthly Review article tells the story of a dismantled Yugoslavia, where not only internal problems, but also external political pressure, especially from the US, tore the country apart. According to the article, the US - acting through NATO - legitimized the military interventions in Bosnia and Kosovo by calling them "humanitarian interventions." At the time, the Security Council did not approve the interventions, but it later provided the US with an ex post facto legitimacy. The authors argue that Western media and politicians have simplified the history of the Balkan civil wars, portraying the wars as a battle between good and evil, while neglecting the role and interests of the US. This report by the University of California, Berkeley supports the concept of Responsibility to Protect (R2P) and offers suggestions on how to move R2P from principle to practice. The study suggests the UN should bring R2P into force in order to "prevent, react to and rebuild after mass atrocities in the 21st century." The report, however, does not reflect on whether powerful countries will use force to promote their own national strategic goals rather than for "humanitarian purposes." Al-Ahram discusses how US policy influences UN action. On the pretexts of "humanitarian intervention" and peacekeeping, the US and NATO have solicited UN blessing for self-interested projects in the Balkans, Afghanistan, Iraq and now, Sudan. The article concludes that, if it can shake off US control, the UN will be better equipped to preserve "international peace and security" as its founders envisioned. The New York Times reveals that the "Save Darfur" campaign greatly inflated the number of deaths in order to heighten the sense of crisis in Darfur and press for intervention. Experts have contested the widely advertised death toll of 400,000 and the most reliable estimate suggests that there were 131,000 excess deaths in Darfur as of June 2005, after which date, United Nations and relief groups register a sharp drop. According to the Center for Research on the Epidemiology of Disaster, most deaths were due to malnutrition and disease, not violence. "Ultimately, the inflated claims fuel a death race in which aid and action are based not on facts but on which advocacy group yells the loudest," concludes the article. Facts were manipulated in order to promote a policy of humanitarian intervention. "Should a human rights center at the nation's most prestigious university be collaborating with the top US general in Iraq in designing the counter-insurgency doctrine behind the current military surge?" asks The Nation. This article discusses how the Harvard-based Carr Center for Human Rights contributed to the shaping of the new Pentagon "warfighting doctrine" and questions the role played by the human rights institution, known to be a strong advocate for humanitarian intervention. Jose E. Alvarez, Professor of International Law and Diplomacy at Columbia University, warns against turning the idea of "Responsibility to Protect" (R2P) from "political rhetoric to legal norm." Alvarez asks what it means to protect and whether R2P justifies the use of preemptive force, which would explain the concept's popularity among powerful countries such as the US. While the myriad activists rally to intervene in Darfur, where several hundred thousand innocents have died, far fewer people – politicians and public alike – acknowledge the estimated 3-4 million deaths in the Democratic Republic of Congo. This Guardian article argues that the perceived ethnic make-up of the groups in conflict in Darfur – "Arab killers" versus "African victims" - is one reason for the disproportionate attention given to Sudan. The other reason, the author claims, is oil interest, particularly that of China and the US. The article says that "liberal interventionism" is prone to double standards and disaster. This Washington Post opinion piece claims that the withdrawal of US troops would generate more sectarian violence and create a humanitarian catastrophe on the scale of the Rwandan genocide. The author uses the discourse of "humanitarian intervention" to justify the US presence in Iraq. However, critics argue that the occupation has indeed exacerbated, if not generated, violence in the country. "UK foreign policy is at a crossroads," warns this Oxfam report. As a strong supporter of the British-sponsored concept of "responsibility to protect," Oxfam regrets that, after the "success" of military "humanitarian" interventions in Kosovo and Sierra Leone, the spectrum of the wars in Afghanistan and especially Iraq has tarnished the reputation of British foreign policy, as London advocates for the protection of civilians in Darfur. The newest dogma in the international community, following Humanitarian Intervention in the Nineties, is the Responsibility to Protect, adopted by the UN in 2005. The author of this Harvard International Review article looks at four cases where so-called humanitarian intervention took place, namely the First Gulf War, Somalia, Rwanda, and Bosnia. He warns about embracing new doctrines for humanitarian intervention uncritically as states with geopolitical interests can hide behind a moral obligation. According to the author, the consensus among many Western leaders, that humanitarian interventions are above criticism, vilifies any attempt to discuss alternative solutions. This London Review of Books article discusses the consequences of a potential humanitarian intervention in Darfur. The author argues that foreign military intervention in Sudan – as lobbied for by the organizations that make up the Save Darfur campaign – will only result in an escalation of violence. Instead the most effective way to end the crisis is to focus on negotiating a political settlement between the different parties and realize that "peace cannot be built on humanitarian intervention." This Global Research article discusses the concept of humanitarian intervention and the different actors involved – as well as their associated motivations – in pushing for intervention. In the case of Darfur, the author argues that a complex web including corporations, nongovernmental organizations and Western media outlets are all complicit in pushing governments to act to "save" the victims of the crisis. However, the article maintains that the motivation behind such intervention ultimately comes down to access and control of natural resources. This Washington Post piece points out that "humanitarian intervention," one of the justifications used by the coalition for the 2003 US-led invasion of Iraq, leads to large scale human rights abuses, civilian casualties and sectarian violence. Author Eric Posner argues that all interventions based on such justifications fail to "liberate citizens from tyrants." By replacing old dictators with foreign occupying forces, intervening countries further increase tensions and the risk of civil war, and subject civilians to a state of constant warfare. While Ottawa has invoked the principle of "responsibility to protect" individuals from gross human rights violations to justify Canada's intervention in Haiti, this Znet piece argues that removing Jean-Bertrand Aristide from power has "exacerbated, rather than improved Haiti's human rights situation." This article critically comments on the conclusions of a Lancet study in light of Canadian involvement in Haiti, and questions the very arguments of the "Responsibility to Protect" doctrine. The global community's growing interest in fighting impunity for crimes against humanity has contributed significantly to the internationalization of law. This Integrated Regional Information Networks report examines the historically complex relationship between international criminal law and state sovereignty. The report further analyzes the controversial concept of "humanitarian" intervention, which some defend as a means to justice, but critics often deride as a tool used by powerful nations to meddle in smaller states' affairs. This two-part article discusses the extent of Canada's participation in the US-led 2004 coup that ousted Haiti's democratically elected President Jean-Bertrand Aristide. Publicly, Ottawa denies any involvement in the coup and maintains that Canada was seeking a peaceful settlement to the crisis. However, according to classified memos obtained by the Dominion, Canada was planning the removal of the Aristide government under the "responsibility to protect" doctrine months before the coup. This principle justified the military intervention under the guise of "humanitarian intervention for human protection." But rather than avert a crisis, the "duty to protect" intervention in Haiti became the backdrop for a major escalation of atrocities, with thousands killed and hundreds jailed for their political views, all to serve Canadian, US and European political and economic interests in Haiti. Focus on the Global South's Executive Director Walden Bello criticizes the rationale behind the concept of humanitarian intervention. By using force against a sovereign country, humanitarian intervention not only undermines international law but also causes greater human rights violations in that country. Bello also warns that these military actions set the stage for future cases, letting the "hegemon" further advance its geopolitical interests. This Briarpatch Magazine article suggests that Canada invoked the "responsibility to protect" (R2P) to legitimize foreign intervention and overthrow Jean Bertrand Aristide in February, 2004. When Aristide put the needs of Haiti's poor ahead of the International Monetary Fund's structural adjustment program, the US, France and Canada rallied behind Canadian MP, Denis Paradis', rhetoric of R2P, to enforce a UN mandate for the coup. As John Pilger puts it, R2P looks like "the latest brand name of imperialism." In his speech at the Labour Party's 2005 conference in Brighton, Britain's Foreign Secretary Jack Straw justifies the war in Afghanistan and Iraq in the context of "responsibility to protect." At the 2005 Millennium Summit, "with the UK in the vanguard," the UN adopted the concept as a major UN reform. While Straw says he favors "collective action" and vows to put the Responsibility to Protect "at the heart of British foreign policy," he defends the occupation of Iraq saying "we are in Iraq to bring about democracy." In his speech during the 2005 UN World Summit, Chinese Foreign Minister Li Zhaoxiang warns the General Assembly against any abuse of the "right to intervene" and insists that the Security Council authorizes any collective action. Li states that China is strongly against "any willful intervention on the ground of rash conclusion that a nation is unable or unwilling to protect its own citizens." David Rieff, in his book "At the Point of a Gun: Democratic Dreams and Armed Intervention," considers the problematic political, legal and moral implications of humanitarian intervention. Reiff examines responses of the international community in face of political conflicts, such as inaction in Rwanda, the late intervention in Bosnia, and the war in Iraq. This New York Review of Books article asks "how can the international community decide when to stand aside and when to act?" Proponents for humanitarian intervention are advocating for the creation of a UN Force, ready to intervene in situations like Rwanda and Srebrenica. Although the UN Charter included a UN capacity for military action, the US and others have always opposed the idea. "Even if a multinational force existed, the UN or some other body would have to authorize action," reminds this Washington Post piece, questioning whether "talk of an international humanitarian intervention force may be nothing more than an academic exercise." This Washington Post editorial questions whether genocide should be the determining factor for humanitarian intervention. As the author demonstrates, genocide is difficult to label, and doing so neither indicates that intervention will happen nor rules out intervention in cases not labeled as genocide. Though the author offers some controversial solutions and even advocates US unilateralism at times, he notes that the using the word genocide leads to a "warped diplomatic parlor game" and that "realities, not labels, should define our response." The author examines US "liberal interventions" in Kosovo and Haiti in 1994, and argues single-power interventions are both politically illegitimate and often lead to further political instability and crisis. US attempts to justify the Iraq war, even in part, in humanitarian terms risks giving humanitarian intervention a "bad name" and breeds cynicism about the use of military force for humanitarian purposes, argues Human Rights Watch.